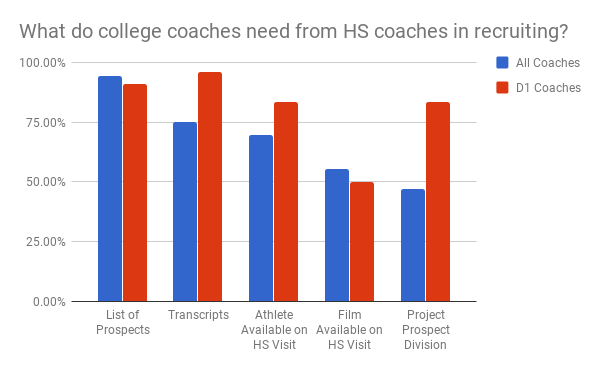 We surveyed coaches across all of college football in order to find out what they are looking for from high school coaches during the recruiting process. Our data has verified something that many of you have suspected, the D1 recruiting process is different than the process for other levels. You need different approaches when it comes to working with D1 coaches. What do college coaches need from you? All coaches agree that they need a list of prospects to evaluate. College coaches indicate that tracking down transcripts is too time consuming. Include transcripts in the package you send to college coaches. This is especially true for D1 coaches. We have found that some HS coaches get their players and parents to sign off so they can send a single pdf of all the transcripts as an attachment with their list. It is easy and efficient for you and the college coach. A majority of college coaches surveyed don’t care about the projected division (level of play) of your athletes. However, D1 coaches were the exception, with over 80% of D1 coaches requesting the projected level of play for your athletes. D1 coaches usually recruit many more schools and need the HS coaches’ help to cut down on the number of tapes they need to watch. All coaches agree that you can help by getting involved. Your athletes need highlight tapes and to skip the calls because they don’t have the time. E-mail D2 and D3 coaches to get your players info out there. D1 coaches prefer to see your players in person at their summer camps. What Are College Coaches Looking For When Recruiting High School Athletes?